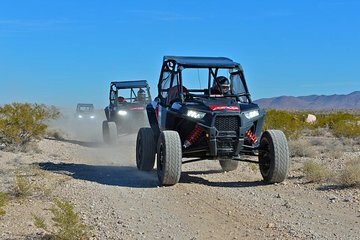 Go off-roading in the Mojave Desert on an adventurous RZR tour from Las Vegas that puts you behind the wheel of a powerful 4-wheel-drive vehicle. You'll suit up in safety gear and a radio-equipped helmet, then rev the engine as you roar over desert trails and follow parched river beds. With pickup and drop-off from select Las Vegas hotels, this tour gets you out of the city and deep into the wild, scenic Mojave. Please wear comfortable clothing, closed-toed shoes are required. Please note: Since both tours include a 30-minute orientation, ride times vary from 1.5 to 2.5 hours depending on tour selected. Tyler and Nate were awesome!! Very friendly and really fun!! The next time I’m in Vegas I will return!! My favorite part of our Vegas trip. Complete professionals from beginning to end. Tons of fun. From the experienced ATV couple that was part of the group - back to us Newbies -- everyone had a great time. Absolutely recommend this excursion!